For the last few days, we have been at the whims of the spirits of Antarctica. We first had to flee from an approaching storm our most desired drilling site, the shelf site that will recover the Greenhouse sediments deposited in shallow waters. The previous days were perfect for drilling and enjoying the vistas that we were afforded from our little perches on the deck. However, the spirits of Antarctica tried to be sly, even on our day of departure from among the flotilla of icebergs that loomed close by the weather beckoned us to linger a bit longer. Even the wildlife seem to come out and bid us to stay. For the seas were calm and the skies deep rich blue as to be almost mocking our decision to stop drilling, pull up our pipes and scurry away like a frightened puppy hearing a rumble of thunder in the distance. However, these icebergs and mile long island of broken and twisted sea ice would most definitely be of serious hazards if the winds and waves decided to return. 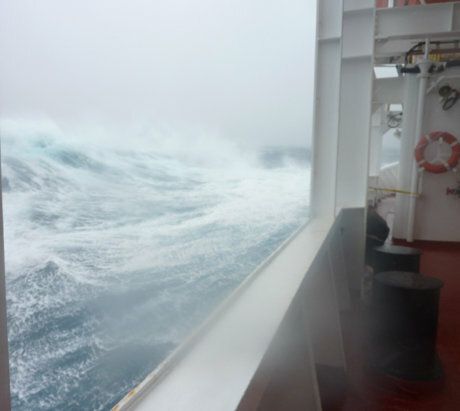 Our weather and sea ice experts had given fair warnings to our Captain, who understood how seemingly coy Antarctic weather can be in one moment and how brutally unforgiving in the next. So as we sailed past a wide boulevard of towers of white and blue ice, it seemed as if we were a world apart from this furious storm that the computer models kept beseeching us with dire warnings. But, for us the danger would be to linger in this seemingly benign place only to find out under the frown of night, starless and exposed, with the sudden arrival snow and sleet, the visibility would be lost. Then we would be near this boundless continent in the dark and trapped among its children of wild directionless icebergs and caught among its wild weather madness. If we had lingered, the icy spirits of this realm would have watched in amusement of our dire predicament of being vulnerable to the ever-threatening storms of Chaos that would bring blustering winds & inclement skies, angry walls of exploding waves that would attack our bow, and winds that would rip at our derrick that rises high into its lair. By the time I awoke the next morn, it was clear that the Captain had once again, chosen wisely. As if bursting from its dungeon, this most recent of storms was armed with ice and snow, and stormy gusts of near hurricane force that lifted the waves to extremes. As if the polar winds were blowing adverse upon this cold most southerly sea next to Antarctica, it drove mountains of icy water high up past 30 feet, crashing on the front of the bow, then lifting the ship high up only to crash down into the next massive wave. The sea was most furious as had been whipped up by these most chaotic winds that blow most perversely. As I gazed out beyond this most brutal sea, I tried to imagine Antarctica, frozen, dark and wild and the creator that spawns these seemingly perpetual storms. A place of whirlwind like that throws at us piercing hail and snow, which on its terra firma, never thaws, but continues to gather its icy heaps of snow and ice. But a place that draws me back time and time again as although it is full of fury and danger, it is also a place of unique beauty, discovery and wonder.